Beat the butter and cream cheese together. Stir in the flour, sugar, and almonds. Cover the mix and refrigerate it for about an hour. When chilled, divide the dough into four equal parts. Shape each of the four parts into twelve little balls. Put each in one of the cups of a small muffin tin (1 3/4 inches across), and press the dough until it looks like a little cup, lining the bottom and sides of the tins. Heat the oven to 375º F. Beat the eggs in a bowl, then add the condensed milk and vanilla and stir it up. 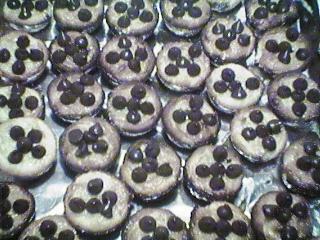 Put a few chocolate chips in the bottom of each shell, then fill them all 3/4 of the way full with the milk mixture. Bake them for 18 to 20 minutes (the tops will puff and turn golden brown, just barely), then remove and cool about 3 minutes. Sprinkle the tops with more chocolate chips. Cool in pan, then remove and store in an airtight container until it's time to eat! NOTE: This recipe was originally called "Cinnamon Chips Gems," and instead of mini chocolate chips they used something called "cinnamon chips." I don't see that those are readily available, plus I'm allergic to cinnamon, so I altered the recipe, but you are welcome to try the original should you be so inclined!